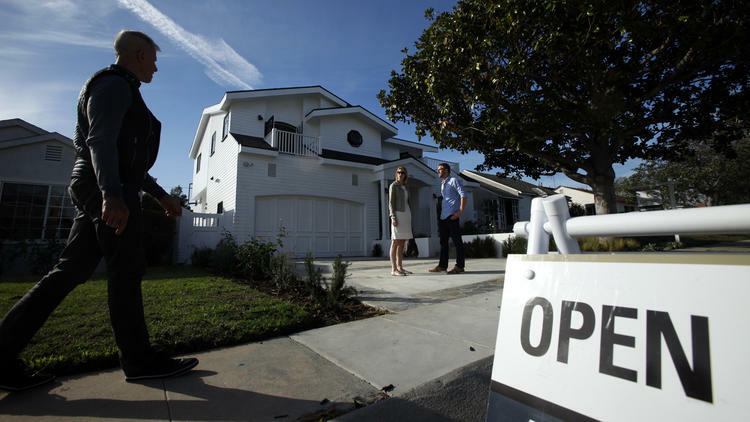 Southern California home prices and sales climbed in April for the second straight month after a period of stagnation. The gains, however, may signal a tough summer ahead for buyers, who face a dwindling supply of homes in most areas. The price and sales gains in April, reported Tuesday by real estate firm CoreLogic, followed a long cooling-off period after the torrid price gains of two years ago. This spring’s market appears more healthy, with prices up a moderate 6.2% from April 2014, to a median of $429,000 across the six-county Los Angeles metropolitan area. Sales volume climbed 8.5%. Those sales are outpacing the number of new listings, according to the California Assn. of Realtors. In Los Angeles County, for instance, every home on the market would sell in 3.6 months at the market’s current pace, down from a three-year high of 5.2 months in February — which was close to what economists consider a balanced market between buyers and sellers. Shrinking supply could signal higher prices and fewer sales ahead. “Unless this increase in prices encourages more people to come out and list their home, I don’t see how it continues,” Selma Hepp, the state association’s senior economist, said of the trend of rising sales. Meanwhile, more buyers are crowding into the market, drawn by an improving economy and the prospect that historically low interest rates may soon rise, said Steven Thomas, who tracks the Southern California market at Reports on Housing. A more extreme version of this dynamic played out two years ago, when supply was tight, bidding wars routine and prices climbing 20% or more on a year-over-year basis. Two years ago, many homeowners couldn’t list their homes for sale because they still owed more on their mortgage than the house was worth. That’s less of a problem now. CoreLogic estimated just 6.7% of mortgages were underwater in the fourth quarter of 2014. That doesn’t necessarily mean owners are itching to sell, Thomas said. The ups and downs of the last decade, he says, may have convinced more owners that staying in one house for a long time has some value. “Everyone’s just kind of staying put,” he said. One traditional solution to tight supply has been new construction, but home builders remain cautious. Permits to build single-family homes fell 12% in Los Angeles and Orange counties in the first three months of the year, according to Census Bureau data. And while permits are up 7% in Riverside and San Bernardino counties, they remain far below the pace set during the Inland Empire’s home-building heyday a decade ago. Still, some builders see opportunities. the Inland Empire. Sales on the first one to open, in Yucaipa, have been strong, said Chief Executive Ian Griffin. He expects that will continue. Listings of existing homes are also up significantly in the Inland Empire, unlike many areas of the region. The number of listings in Riverside and San Bernardino counties is up 24% compared with a year ago, according to data from brokerage firm Redfin. Paul Reid, a Redfin agent in Temecula, said that’s allowing buyers to take their time and find a house they truly want. Closer to the coast, though, the race is on. Simon Mills, whose Mills Realty in Toluca Lake specializes in helping sellers, says he has seen well-priced homes get multiple offers fast. That’s still driving up prices, maybe still too fast to be sustainable.